Swype is one of the most awaited features for the iOS devices, and this was available for the Android devices since long, and yes, Symbian too gave this app for test to the Symbian users but iOS devices kept waiting. Now, the app is available through Cydia in the Jailbroken phones and the iPhone, iPad and iPod touch users can test out the functioning of Swype in their devices. Note: This is an unofficial version, made by a developer not associated with the Swype, Inc. who does the official Swype for all the mobile operating systems. It would get installed and then you would see the repo having 3 apps available, one of them being Swype. Install Swype from there, and once the installation is done, it would ask you to restart the Springboard. It restarts by itself, once you click on “Restart Springboard” and the installation is done. You can check the accuracy and functioning of the Swype by going to Notes and trying to drag the finger over a few letters one after the other to make a word. The response is still not perfect, and when compared to the Swype feature of the Android phones, it is still far behind. This is not the official version, so it is not available directly through the Apple App Store. You need to have an iPhone or iPad that is jailbroken, and have the Cydia app to install the 3rd party applications in the device. 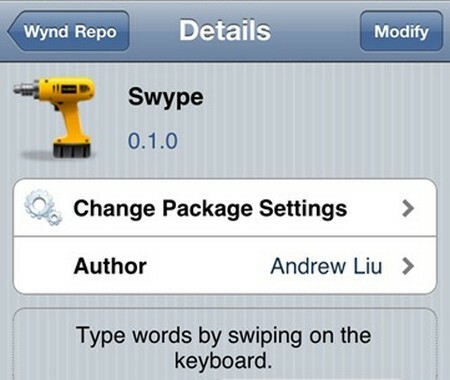 The Swype feature is particularly helpful in making the typing easier in the iPhone, iPad and the iPod touch. We would still be waiting for the official version of the Swype that would be made by Swype, Inc. and that would surely take some more time. This swype app would surely be the best alternative (actually the only swype app for iOS, not an alternative) with everything almost similar to what we see in the Android Swype.